Jesus reached out his hand and touched the man. ‘I am willing,’ he said. ‘Be clean!’ Immediately he was cured of his leprosy. When a prison nurse called to tell me I had been exposed to tuberculosis, I was not surprised. I assumed the exposure came from where I worked in the prison. The prisons try to control contagious diseases by placing inmates in separate cells from each other, but we usually don’t know where we contact bacteria and viruses. We share common places, turn the same door knobs, breathe the same molecules. In Jesus’ day, those with the disease of leprosy were often separated from society, not only because they had a sickness, but also because it was believed that lepers had committed some sin. The powerful commander Naaman asked God to cure his leprosy, and he received a humble (and humbling) way to cure it. We are often given small, simple ways to believe in God’s power. He is nearby wherever you are— in a prison cell, in your office, on the street. Turn to Him and be washed in Jesus’ blood. God’s grace is sufficient to break down the walls that imprison us, to snuff out whatever it is that makes us unclean, and to heal us of our sin. 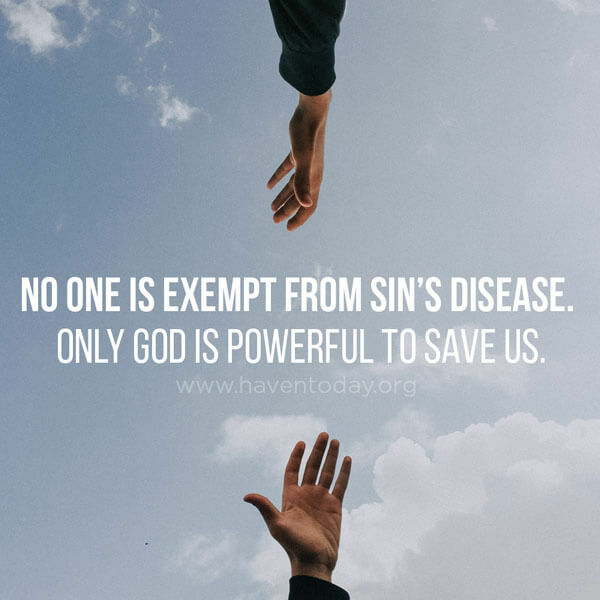 No one is exempt from sin’s disease. When we come to Jesus, He washes us clean. Only God is powerful to save us.